This never-used leather handbag is made from full grain leather. The original manufacturer's tag with a price of $148.00 is still attached. It has a thick grosgrain fabric lining in a deep burgundy color with an interior zippered pocket. 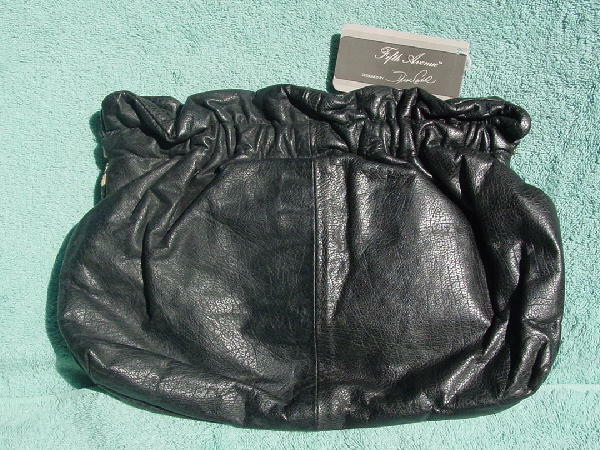 This Fifth Avenue Handbags purse was made in the USA. It has a 46" long leather shoulder strap. 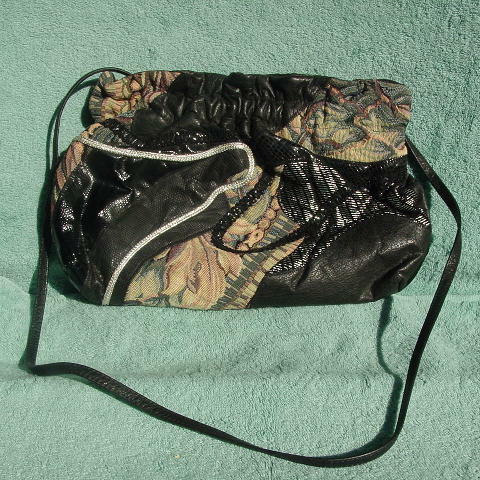 The front has tapestry, leather with silver-lame horizontal lines, black leather, shiny and flat black leather in a faux reptile pattern with silver lame cord and black fabric cord. The top has 2 side hinges which pull open and push closed. You can tuck in the shoulder strap and carry the purse as a clutch. A model got it as a present from her now-ex-mother-in-law.